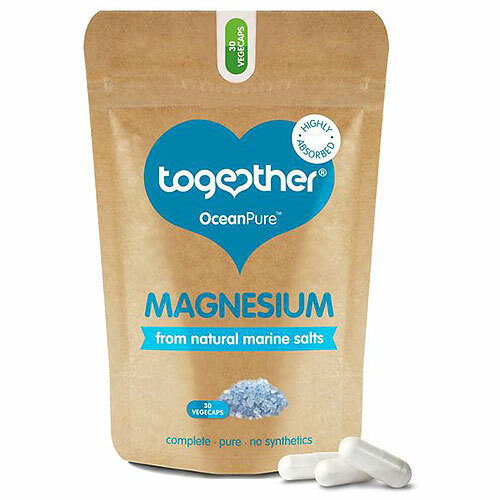 Together has taken all the goodness from one of nature’s purest offerings and sourced this OceanPure magnesium from the deep blue, mineral-rich waters of the Mediterranean Sea. This magnesium supplement is complete, containing the 5 natural forms: oxide; hydroxide; sulfate; carbonate and chloride. Our bodies are able to recognise minerals with ease when they’re taken from natural sources rather than synthetically created. This means that we identify and absorb all that natural goodness far more effectively. Together use evaporation and natural purification techniques to clean our sea water and gently extract the magnesium. Chemical free and pure, this is magnesium as it should be. Take one to two vegicaps daily as a food supplement with or without food, or as directed by a practitioner. 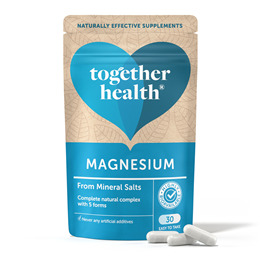 Below are reviews of Together Magnesium - 30 Vegicaps by bodykind customers. If you have tried this product we'd love to hear what you think so please leave a review. I have on and off sinus problems, I then started developing a very annoying eye twitch that I couldn't get rid of which started after a year of intense stress. After reading about magnesium I realized it seemed logical that I would be deficient in Magnesium. I tried a few brands but nothing really changed. I then decided to try this brand, A few days after taking this supplement my eye twitches stopped! And a week later my sinuses started easing off. I took them for a few months, and then forgot to re-buy another packet, my sinuses became painful again and my eye twitches came back! I started taking this supplement again and it instantly went away! I've now been taking it for a month and I feel less depressed and less unwell! Couldn't recommend this brand enough! The quality of magnesium in comparison to other vitamins out there is incredible!